Bigger and fuller lips are a sign of beauty and everyone considers them charming. Even if you have small lips you can always make them look bigger without surgery or injections. There are so many ways you can enhance the way your lips look and most women go for aesthetic surgeries and botox or hyaluronic acid injections. Are they really necessary? Yes, if you want permanent big and full lips, no, if you are satisfied with using makeup to obtain the same effect and it isn’t hard at all. To have big, beautiful lips first you have to take good care of them which means exfoliation and moisturization on a regular basis. See the directions and the pictures below! Directions: After you have done exfoliating and moisturizing your lips, take the lip pencil and start contouring them, you want to do this slightly over the natural shape of the lip, this will make them look bigger. 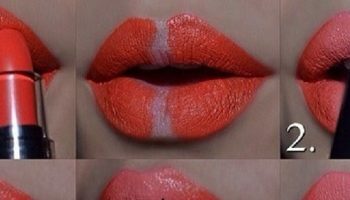 Apply some concealer on the middle of your lips, this will create a depth to them. 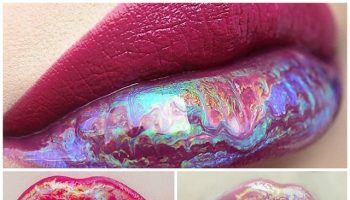 Apply the lipstick then the lip gloss to give a much bigger effect to the lips. 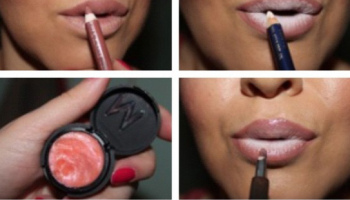 Take the highlighter and apply some on your cupids and your lips will look much fuller. This was it, everything summed up doesn’t take more than 5 minutes to do and you get amazingly big and full lips. Try it out!